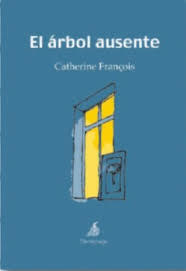 In The Absent Tree, Catherine François tells experiences of her childhood in the outskirts of Paris in the early 1960s. “Memories of a time and a place in which everything is a sign” says Santiago Auserón in the introduction. Fascinated by the suggestive power and the ambiguous sense of words, in the border where the repetitive geometry of the city meets the natural surroundings turned into an empty land, the little girl of the story and her group of friends take us back to the intrigue of these situations, apparently innocent, upon which the plot of the significances is built, along with the mysterious relationship between presences and absences, between sounds and silences. Through captivating scenes in which what can hardly be named reveals itself with surprising clarity, by means of germinating ideas and fast impressions that the reader acknowledges as part of a common memory, this book manages to transmit the emotion of the emerging thought that faces the complexity of the world. François’s prose reaches a lyrical dimension in the task of preserving, for adult life, the adventure of learning.